MADBAN VILLAGE (RATNAGIRI): This tiny village took on the might of the state on Friday and by the evening, victory clearly belonged to it. Despite preventive arrests, prohibitory orders and road blocks more than 3000 villagers’ courted arrests, as part of their ‘Jail Bharo’ agitation. By 6 pm, the police requested the leaders of the agitation to stop the flow of people. The agitation was primarily in response to the government claim that the villagers were quiet and only a handful of outsiders were leading the agitation against the proposed 10000 MW nuclear power project in the village. The agitation started peacefully at noon at Bhagwati temple in the village. Hundreds of women including the elderly queued up to be arrested, followed by the men folks. The police had arranged for four ST buses, but they failed awfully short, as villagers of Madban and the neighbouring villages continued to pour in. The 250-strong contingent of policemen came prepared with riot gear and rifles, but there was not even slogan shouting. “This is a show of strength and the government must now realise that we cannot be taken for granted,” Pravin Davankar of the Janhit Seva Samiti, which has been opposing the project for the past five years. Arun Velaskar of the Konkan Bachao Samiti said, “The repressive measures of the state would not be tolerated.” Vivek Monteiro, a labour leader said that AREVA, the French firm, which has been given the contract for the nuclear reactor, is under a cloud in Europe. The villagers were angry because the government was refusing to tell them the truth and releasing information in bits and pieces. “After all, we are the ones to be directly affected,” said Sanjay Gavankar, a villager, who runs a cashew nut factory. The villagers had steadfastly refused compensation and even lit bon fires of the revised compensation package announced by the state revenue minister Narayan Rane, who’s son Nilesh, is the MP from Sindhudurg-Ratnagiri. Retired High Court judge B G Kolse-Patil, who had being served orders preventing him from entering Ratnagiri District, flouted the ban and attended the rally. While the police were looking for him on the road, he took the sea route and appeared dramatically in the temple at 3 pm. “I will oppose this sort of high-handedness by the state tooth and nail,” he said. The police had to physically carry him off to arrest him. Retired Admiral L Ramdas and retired Supreme Court Judge P B Samant, who were coming to the rally, were stopped by the police at Hativali junction on the Mumbai-Goa Highway. Uma equipe do Greenpeace vem fazendo visitas constantes ao mercado de quinquilharias de Mayapuri, cidade de Nova Déli, na Índia. E não é para fazer compras. De medidores de radiação em punho, eles checaram – e comprovaram – que os níveis de contaminação na área estão muito acima do recomendado. As checagens começaram após morte de um funcionário do mercado por exposição à radiação no mês passado. Segundo as autoridades indianas, o problema veio de uma pastilha contendo Cobalto 60, material altamente radioativo, que teria sido vendida pela Universidade de Déli, como ferro-velho, no mercado. A área chegou a sofrer um trabalho de limpeza após a denúncia do Greenpeace, mas nova visita ao local revelou que os traços de radiação ainda são fortes. O contato com material radioativo causa uma série de doenças, além de mortes imediatas por Síndrome Aguda de Radiação – SAR. O caso lembra o maior acidente radioativo do mundo, que ocorreu no Brasil. Conhecido como Césio 137, em referência ao material radioativo que vazou de um aparelho radiológico jogado fora em ferro-velho de Goiânia (GO), o acidente ocasionou diversas mortes por SAR. Para saber mais, acesse site criado em 2007, em homenagem aos 20 anos do acidente. The U.S. is pushing India to limit the liability of nuclear-energy firms doing work in that country. Even as President Obama is insisting that BP pay for all the damage caused by its oil spill, his administration is leaning on the Indian government to render its citizens unable to claim damages from U.S. power-plant suppliers in the event of a nuclear accident. Before U.S. companies enter India’s burgeoning nuclear-power market, the U.S. government is pushing for legislation limiting their liability. “The passing of the bill by Indian parliament would mean a win-win situation for both the countries, generating employment a well as giving India abundant clean energy,” U.S. Ambassador Timothy J. Roemer said. disasters – though only up to a point. Domestic operators’ liabilities are to be capped at about $110 million, after which the Indian government would be responsible. If damages exceed $460 million, the victims would be on their own. The Chernobyl disaster is estimated to have cost more than $250 billion. In the event of such a catastrophe, India’s liability bill would put almost the entire burden on victims and taxpayers, giving suppliers and operators less incentive to ensure safety. To be sure, indemnifying suppliers and capping the liability of operators are the international norms, or else few companies would be in the nuclear business. The Price-Anderson Act, which regulates liability for nuclear accidents in the United States, also channels costs to operators and caps them at $11 billion (to be shared by the industry as a whole). That is a considerable sum, though it’s arguably inadequate in light of the staggering potential costs of a nuclear calamity. Nevertheless, the law allows victims to sue for additional damages. Indians, by contrast, stand to lose this right under the proposed nuclear-liability law. 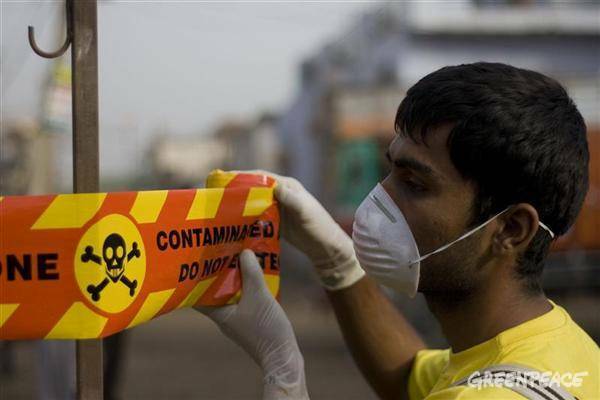 Arguments over India’s nuclear bill have been particularly passionate because of memories of the night in December 1984 when clouds of poison gas escaped from a Union Carbide pesticide factory in Bhopal, in central India. At least 15,000 people have died as a result, and more than 100,000 have suffered permanent impairment. At the time, the Indian government estimated damages at $3.3 billion, and today, given extensive long-term effects that no one foresaw, they would be reckoned as far greater. But Union Carbide paid a settlement of only $470 million. Circumstantial evidence suggests the Reagan administration prevailed upon Indian leaders to go easy on Union Carbide. feeble, and their governments too subservient, to demand accountability from corporations and their backers. India hasn’t even been able to get Dow Chemical, which subsequently bought Union Carbide, to remedy the Bhopal site, which still leaches toxins into the city’s groundwater. Just days ago, public fury over a long-delayed, lenient verdict for seven men accused in the Bhopal case – all Indians; no American has ever stood trial for the catastrophe – induced the Indian government to announce a $325 million relief package, to be paid for by taxpayers. In contrast, Obama has been remarkably successful in gaining redress for the oil spill in the Gulf of Mexico. The $20 billion fund he obliged BP to establish greatly exceeds the liability cap of $75 million set by American law. The move prompted the Economist, which feels the pain of investors, to warn of the “scary” prospect of unlimited liability. In fact, a lifting of liability caps in the United States would exacerbate dirty industries’ tendency to relocate to corners of the earth where lives are cheap and governance is weak. Increased accountability in powerful countries makes it all the more imperative that residents of poor and corrupt countries also find ways to make corporations share the suffering. Will they get help from Obama? In a recent letter to the president, Bhopal victims asked that he force Dow to provide adequate compensation and clean up the contaminated site. “Is it too much to expect that you use the same yardsticks of accountability you are using for BP . . . for corporations based in the country you rule?” they asked. How the president responds to their plea remains to be seen. But it’s worth noting that an administration that wouldn’t dream of curbing Americans’ rights to redress is demanding that Indians hurt by nuclear accidents be precluded from suing those who may be responsible. Madhusree Mukerjee can be reached at lopchu@madhusree.com.